You can follow here Promojay's news and more: work in progress, news, future real estate programs, partnerships, information regarding the resort's life. You can also find us on facebook, twitter, instagram, pinterest. “L’Etable” program is the rehabilitation of an old farmhouse, located in the heart of the historic village of Saint Martin de Belleville. This traditional mountain building, with its vaulted stable, stone walls and roof made of wood and slate, has undergone a renovation respecting its identity while revealing its modern housing potential through the reconfiguration of buildings existing volumes and the realization of high-end finishes. We conducted throughout 2018, a complete restructuring of the building. Covering both major structural work and underpinning for the creation of an additional basement, only on high quality interior finishing work. On the ground floor: entrance, 2 bedrooms with 2 bathrooms. 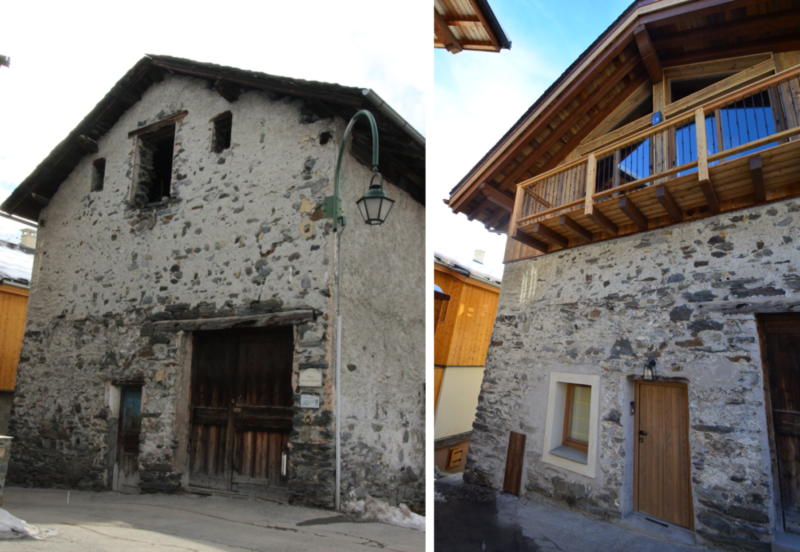 This project is part of the guiding principle of our philosophy: the enhancement of local heritage by preserving and restoring the soul of old chalets, bringing a touch of modernity and innovative ideas, and with the will to create a delicate alchemy between the past and the present.